2.3 2017–2018: Poppy.Computer, Poppy.Church, Mars Argo lawsuit, and Am I a Girl? Moriah Rose Pereira was born in Boston, Massachusetts on January 1, 1995. She recalls wanting to be a Rockette as a child and grew up dancing, which she did for 11 years. She is naturally a brunette. At the age of 15, Poppy left home for Los Angeles in pursuit of an entertainment career. Prior to 2014, Poppy performed at social media festivals, including VidCon in June 2012 and DigiTour in June 2013. Poppy began her musical career by singing cover songs on the internet. Poppy moved to Los Angeles in 2013 to pursue her musical career. There she teamed up with director Corey Michael Mixter, known by his stage name Titanic Sinclair, to make a series of abstract promotional videos on a YouTube channel originally titled "thatPoppyTV". The channel is now simply known as "Poppy". As of April 2018, the channel is actively uploading videos and has attracted a large audience. In 2015, she signed to Island Records under the name That Poppy and released her debut song, "Everybody Wants to Be Poppy", in June of that year. She performed at the Corona Capital Festival in November 2015. She released the song, "Lowlife", a month after releasing her first single "Everybody Wants to Be Poppy" and released her first EP, a four-track pop record called Bubblebath, on Island in February 2016. In August 2016, she released a series of advertisements for the shoe company Steve Madden on her channel as a part of its Steve Madden Music program. In October 2016, Poppy released an experimental ambient music album called 3:36 (Music to Sleep To), composed by Titanic Sinclair and herself, with assistance from polysomnographists from the Washington University School of Medicine. In November 2016, she became the face of Japanese retailer Sanrio's first "Hello Sanrio" collection. In February 2017, Poppy starred in a series of videos for Comedy Central called "Internet Famous with Poppy". That September, she won a Streamy award in the category 'Breakthrough Artist'. Poppy's debut studio album, Poppy.Computer, was released on October 6, 2017 by Mad Decent. Her first concert tour, the 36-city Poppy.Computer Tour, started on October 19 in Vancouver. In November, Poppy announced that her second studio album was "almost ready", and that she was going to Japan again to finish it. On January 1, 2018, Sinclair confirmed on his Twitter that he and Poppy were in Japan recording that album. In an interview conducted on January 11 by AWA in Japan, Sinclair stated that the recording for the album was completed the day before on January 10. According to him, it will feature both references to Japanese and French culture. He also commented that the album takes heavy influence from vaporwave such as its keyboard sounds and "very strange sounding synthesizers", which are used "almost exclusively" on the album. Poppy made her YouTube Rewind debut in 2017, and was one of the few content creators to get their own lines. In March 2018, Poppy performed at the Japanese pop music festival, Popspring. On July 6, 2018, Poppy released a cover of Gary Numan's song "Metal" as a single on all digital platforms. On July 27, she released the first single for the album Am I a Girl? titled "In a Minute". She released the album's second single "Time Is Up", which features American DJ Diplo, on August 22. she released "Fashion After All" on October 12. "Hard Feelings" was released on October 19 and "X" was released on October 25. In September 2018, Poppy announced on her social media that she was already working on her third studio album. On September 11, Poppy's Twitter account announced an album release and costume party for October 31. In 2018, Poppy began to drop hints about a new project and website called Poppy.Church. At first, the purpose of the website was not known, as it only featured a cryptic message and an opportunity to enter one's phone number. After a few months, however, the purpose of the site was made clear. Every day at 3:36 PDT, certain people who entered their phone number would receive a link to join the Church. There they could fill out a profile, create an avatar, and pledge their allegiance to her. As of August 24, there is an Atrium, which acts as a chatroom, a theater, a gallery which changes weekly, a lobby like another chatroom, a bulletin board with announcements, a personal report page, a box office selling tickets for Poppy's Am I a Girl? tour, a backpack, and a settings page to edit contact information and character. On August 23, room invites were sent out to members of the Church who were showing "Faith, Dedication, and Loyalty". There are 100,000 rooms, with 1,000 halls connecting to the corresponding 100 rooms in that hall. (For example, Hall #1 has rooms 1-100, Hall #2 has rooms 101-200, and so on.) Members of the Church can visit each other's rooms, leave comments on their walls, and access provided social media. Poppy attended the 2018 American Music Awards. After winning the Breakthrough Artist in 2017, Poppy returned to the Streamy Awards in 2018 as a presenter. On January 8, 2019, Poppy announced that she will be releasing a graphic novel through Z2 Comics entitled Genesis 1, set to release in July 2019. The graphic novel will tell the origin of Poppy. The description on Z2 comic's website reads "Is she a girl? Is she a machine? Is she humanity’s redemption, or its damnation? Don’t be scared — either way, she is Poppy… and you love Poppy. Witness the genesis of the internet phenomenon in this original graphic novel, bundled with an exclusive brand new album." It is co-written by Poppy, Titanic Sinclair, and Ryan Cady, with art by Masa Minoura and Ian McGinty. Poppy elaborated in an interview with gigwise that the album released with the graphic novel will be of ambient music meant to be listened to while reading. She also said that she will be releasing a third studio album in 2019 and it would be an I'm Poppy Records release, unaffiliated with Mad Decent. On January 23, Billboard announced Poppy would be starring in the augmented-reality experience A Jester's Tale (2019) created and directed by Asad J. Malik. The project is produced by RYOT and 1RIC, premiering at the 2019 Sundance Film Festival as part of the New Frontier program. The storyline "transports viewers inside a child's bedroom to meet a cast of character holograms". Later that month in an interview to Forbes, Poppy announced she would be releasing a new single called "Voicemail" along with a music video, produced and directed by Titanic Sinclair. It was released on January 31.After attending the iHeartRadio awards in 2016, Poppy returned in 2019 wearing a dress designed by Viktor & Rolf,who's fashion show she sat front row at. In 2019, Poppy revealed plans for a movie and her own music streaming service. Poppy's YouTube channel was created on October 6, 2011, and her earliest video is from November 2014, an abstract skit called Poppy Eats Cotton Candy, directed by Titanic Sinclair. The videos are described by their producer Sinclair as "a combination of Andy Warhol's pop accessibility, David Lynch's creepiness, and Tim Burton's zany comedic tone". The channel has been discussed by other YouTubers, including PewDiePie, Social Repose, Night Mind, the Film Theorists, Reaction Time, and the Fine Brothers on their React series. She starred in an episode in which she reacts to children reacting to her videos. She has also appeared in an episode of the acclaimed web series Good Mythical Morning. Sinclair alludes in an interview that Poppy's character in the promotional videos presented itself to him as an android and how some of the concept relates to the uncanny valley hypothesis. Poppy has stated that her YouTube videos tell a story. Aside from her abstract promotional videos, Poppy's channel features her original music, various covers, and acoustic versions of her songs. Poppy's friend Charlotte, a celebrity-interviewing mannequin with a synthetic voice, is a recurring character. She usually appears interacting with Poppy but also on her own. She appears to have developed a drug and jealousy problem after Poppy became famous, which strains their relationship, although Charlotte became Poppy's opening act for her 2017–2018 Poppy.Computer Tour. Other characters include Charlotte's son, a boy mannequin who has taken the brunt of abuse at the hands of his mother during a drugged stupor; Plant (voiced by Sinclair), a potted basil plant who is one of Poppy's closest friends and biggest supporter; and Skeleton (also voiced by Sinclair), a plastic model skeleton who is revealed as Charlotte's drug dealer. The channel also has an animated promotional miniseries called Everybody Wants to Be Poppy, directed by Titanic Sinclair and illustrated by Melanie Foreman, which stars Poppy as herself, Titanic Sinclair as Rex, actor Matt Bennett as Pho, Canadian singer-songwriter Simon Wilcox as Phoebe, and Los Angeles-based photographer Sam McGuire as Wyatt. The series documents Poppy and Rex's journey as they attempt to find a "magical kale smoothie". I'm Poppy, a short film and the first episode of a television series of the same name written and directed by Titanic Sinclair, made its world premiere on January 23 at the 2018 Sundance Film Festival. In it, Poppy leaves the Internet for the real world and confronts the pitfalls of fame, including cults, deranged fans, Satan, and her bitter rival Charlotte. Poppy explains that her stage name originated as a nickname a friend used to call her. After her friend persistently introduced her as "Poppy", the name stuck. Poppy has described herself as a "kawaii Barbie child". She has described her music style as "music [that] makes you want to rule the world." Poppy states that she drew inspiration from genres such as J-pop and K-pop, as well as reggae. She recalls beginning to write music in 2012. She told Tiger Beat her musical inspirations are Cyndi Lauper, unicorns and Elvis Presley. She is a fan of Jimmy Eat World, No Doubt and Blondie. Poppy's identity was initially kept guarded. She explained, "I don't want people to talk about how old I am; I want them to talk about what I'm making [...] People, especially nowadays, are so obsessed with knowing everything. They'll have to invest their time in finding it." In 2018, Poppy revealed in a statement on Twitter that she had kept her identity guarded due to being a survivor of abuse in the past. In mid-2017, Poppy published a book called The Gospel of Poppy, which parodies the Bible and contains "prayers" and transcripts of her YouTube videos. Critics have both praised the catchiness of Poppy's music and described her persona as distant from reality. Racked called her "sweet, but alien" and "brightly addictive". PopularTV said of her music: "Paralleling Gwen Stefani in the No Doubt era, That Poppy mixes punk with ska-pop and makes you want to get up and dance." The UQ Music Blog described her as "Electra Heart meets Princess Peach". David Mogendorff, who works in artist content and services for YouTube and Google Play Music, said she has "a strong J- and K-pop influence". Poppy's YouTube channel is often regarded as a commentary on social media. Vice described the tone of the channel, saying, "...if you have the patience to work your way through all the videos on this channel, certain trends start to emerge. The most obvious is Poppy's fixation with the internet and social media culture, which she claims to love. But far more interesting is the general tone of the videos, which have gotten progressively darker over the last two years." Gita Jackson of Kotaku suggested the videos are a commentary on the experience of being on the Internet, writing, "In a way, she's made every YouTube video, ever. Her channel is an index of every insincere apology, desperate bid for views and assurance that they couldn't do it without her fans you'll ever see. That Poppy is not only skewering the absurdity of people who make a living as public figures on the internet—she has it out for the entire experience of being online." Mogendorff said the videos are "like social commentary...touch[ing] on the anxieties of modern life" and "a really interesting way of communicating, personal but strange". Poppy has spoken in interviews about her gender identity, saying "I haven't figured it out, but I'd like to stay gender neutral. I don't want to classify myself. I'm just Poppy." Her gender questioning influenced the themes of Am I a Girl? 2016 We Bare Bears Uncredited voice role Promotional short featuring original song called "Just My Type"
^ Pandell, Lexi (June 3, 2017). "Welcome to Poppy's World". Wired. Retrieved February 15, 2018. ^ "Mad Decent". Mad Decent Media. Archived from the original on July 1, 2017. Retrieved May 22, 2017. ^ "Pray 4 Poppy". YouTube. February 19, 2019. Retrieved February 28, 2019. ^ a b "Poppy". Apple Music Preview. Archived from the original on January 5, 2018. ^ Hunt, Elle (December 11, 2017). "Poppy is a disturbing internet meme seen by millions. Can she become a pop sensation?". The Guardian. Archived from the original on January 27, 2018. ^ a b Pandell, Lexi. "Welcome to Poppy's World". WIRED. Archived from the original on October 20, 2017. Retrieved October 19, 2017. ^ "Poppy at Slim's Oct. 26, 2017 - By geoffrey-smith-ii - October 30, 2017 - SF Weekly". SF Weekly. October 30, 2017. Archived from the original on November 12, 2017. Retrieved November 12, 2017. ^ Hunt, Elle (December 11, 2017). "Poppy is a disturbing internet meme seen by millions. Can she become a pop sensation?". The Guardian. Archived from the original on January 27, 2018 – via www.theguardian.com. ^ Niko (March 1, 2016). "That Poppy Talks 'Princesses, Unicorns, and Real Life Experiences' with Niko". 92.3 AMP Radio. Archived from the original on August 16, 2016. Retrieved March 14, 2017. ^ Elyachar, Jacob (July 7, 2015). "The Five Question Challenge with That Poppy". Jake's Take. Archived from the original on August 17, 2016. Retrieved July 15, 2016. ^ "Who Is Poppy? Everything You Need To Know About The Mysterious YouTuber". amp.wetheunicorns.com. Retrieved October 1, 2018. ^ "YouTube Stars Poppy & Sam Pepper Chat New Music, Translate Phrase "Turnt Up"". Fuse. June 11, 2013. Archived from the original on March 5, 2017. Retrieved March 14, 2017. ^ a b c Brooke, Eliza (April 11, 2016). "Parsing the Aesthetics of That Poppy, Pop Singer and Internet Enigma". Racked. Archived from the original on July 18, 2016. Retrieved July 15, 2016. ^ "Corey Michael Mixter". Genius. Archived from the original on October 7, 2017. Retrieved October 6, 2017. ^ "That Poppy Releases "Everybody Wants to Be Poppy"". Island Records. June 23, 2015. Archived from the original on November 5, 2016. Retrieved March 14, 2017. ^ François, Toni (November 24, 2015). "Fotos: Poppy en el Corona Capital 2015". TONO (in Spanish). Archived from the original on March 8, 2017. Retrieved March 14, 2017. ^ Lopez, Ashleyan (June 1, 2015). "Corona Capital announce their 2015 festival lineup". AXS. Archived from the original on March 8, 2017. Retrieved March 14, 2017. ^ "YouTube sensation That Poppy gave us the most wonderfully bizarre interview ever about her life and career". Archived from the original on July 28, 2017. Retrieved July 19, 2017. ^ Steve Madden. "That Poppy: STEVE MADDEN". Steve Madden. Archived from the original on August 16, 2016. Retrieved May 6, 2017. ^ "3:36 (Music To Sleep To)". Bandcamp. Archived from the original on March 8, 2017. Retrieved March 14, 2017. ^ "Internet Famous with Poppy - Brandon Wardell". YouTube. Comedy Central. February 13, 2017. Retrieved March 14, 2017. ^ "Abrams Artists Agency Signs Viral Musician Poppy". Tubefilter. November 26, 2018. Retrieved December 23, 2018. ^ "Poppy's interview with Zane Lowe". Apple Music. July 18, 2017. Archived from the original on February 10, 2018. Retrieved July 26, 2017. ^ "Poppy's interview for 103.3 AMP". 103.3 AMP. November 22, 2017. Archived from the original on December 1, 2017. Retrieved November 22, 2017. ^ "Titanic's Twitter January 1st, 2018". Twitter. January 1, 2018. Archived from the original on February 10, 2018. Retrieved January 3, 2018. ^ "Poppy × AWA インタビュ". YouTube. January 12, 2018. Retrieved January 12, 2018. ^ "Poppy Popspring". Popspring.jp. April 7, 2018. Retrieved April 7, 2018. ^ "YouTube Feud: Mars Sues Titanic and ThatPoppy: You Jacked My Identity!!!". TMZ. Retrieved April 17, 2018. ^ "Poppy Responds to Mars Argo Copyright Suit, Calls It 'Desperate Grab for Fame'". Billboard. Retrieved May 7, 2018. ^ "Poppy and collaborator Titanic Sinclair settle lawsuit with Mars Argo". NME. Retrieved January 8, 2019. ^ "Lawsuit against YouTube personality Poppy dismissed". The Daily Dot. September 18, 2018. Retrieved September 20, 2018. ^ "iTunes Metal". iTunes. Retrieved July 6, 2018. ^ "iTunes In A Minute - Single". iTunes. Retrieved July 27, 2018. ^ "iTunes Time Is Up - Single". iTunes. Retrieved August 22, 2018. ^ "Poppy and Diplo Team Up for New Song 'Time Is Up': Listen". pitchfork.com. Retrieved August 24, 2018. ^ "Poppy and Diplo Celebrate the Robot Takeover On 'Time Is Up': Watch". Billboard. Retrieved December 23, 2018. ^ "Poppy's Twitter September 19th, 2018". Twitter. September 19, 2018. Retrieved September 27, 2018. ^ "Poppy's Twitter September 11th, 2018". Twitter. September 11, 2018. Retrieved October 8, 2018. ^ "Poppy.Church". poppy.church. Retrieved July 30, 2018. ^ "Box Office". poppy.church. Retrieved July 30, 2018. ^ "Poppy Wore a Black Latex Mask to the 2018 American Music Awards". www.wmagazine.com. Retrieved October 10, 2018. ^ "People Are LOSING IT Over What Poppy Wore To The AMAs". amp.wetheunicorns.com. Retrieved October 10, 2018. ^ "American Music Awards 2018 - The Worst Dressed". mirror. October 10, 2018. Retrieved October 10, 2018. ^ "YouTuber Poppy walks the Streamys red carpet with three dates in gimp suits". Metro. October 23, 2018. Retrieved October 24, 2018. ^ "You won't believe what Poppy took to the Streamy Awards..." We The Unicorns. Retrieved October 24, 2018. ^ "Musician Poppy Moves to Comics for 'Genesis 1' Graphic Novel". The Hollywood Reporter. Retrieved January 26, 2019. ^ Mega, Al. "POPPY ANNOUNCES FIRST EVER GRAPHIC NOVEL "GENESIS 1" AVAILABLE JULY 2019 – Comic Crusaders". Retrieved January 26, 2019. ^ a b "Poppy talks new ambient release, being a religious leader, + embracing heavy metal". Retrieved January 25, 2019. ^ "Poppy to Star in Augmented Reality Experience 'A Jester's Tale,' Premiering at Sundance 2019: Exclusive". Retrieved January 23, 2019. ^ a b "Poppy Shares Details On New Single 'Voicemail,' WWE Collaboration, AR Experience At Sundance & More". Retrieved January 25, 2019. ^ Lynch, Kelly (2016-04-04). "That Poppy: 2016 iHeartRadio Music Awards". The Hollywood Gossip. Retrieved 2019-03-17. ^ "Poppy: 2019 iHeartRadio Music Awards". Steal Her Style. 2019-03-15. Retrieved 2019-03-17. ^ Okwodu, Janelle. "Poppy Wears Viktor and Rolf's 2019 Couture to the iHeartRadio Music Awards 2019". www.vogue.com. Retrieved 2019-03-17. ^ Eckardt, Stephanie. "Poppy Shows Up at iHeartRadio Music Awards in Fashion Week's Most Memed Dress". www.wmagazine.com. Retrieved 2019-03-17. ^ "That's Five with Poppy". StockX News. 2019-03-15. Retrieved 2019-03-17. ^ PewDiePie (December 3, 2016). "I'M POPPY!". YouTube. Archived from the original on December 23, 2016. Retrieved March 14, 2017. ^ The Film Theorists (January 24, 2017). "Poppy's Hidden Conspiracy EXPOSED!". Archived from the original on March 12, 2017. Retrieved March 14, 2017. ^ The Fine Brothers (February 22, 2017). "Poppy Reacts to Kids React to Poppy". YouTube. Archived from the original on March 7, 2017. Retrieved March 14, 2017. ^ "Good Mythical Morning S13 E21.2 "Will It Poppy?"". ^ "Poppy Makes a Video For 'Let's Make a Video'". PopCrush. Archived from the original on July 11, 2017. Retrieved July 12, 2017. ^ Lexi Pandell (June 4, 2017). "Welcome to Poppy's World". Wired. Archived from the original on June 4, 2017. Retrieved June 5, 2017. ^ Poppy (April 12, 2017). "Poppy is Over" – via YouTube. ^ "'Everybody Wants to be Poppy' Episode: 1". YouTube. June 9, 2015. ^ "SUNDANCE INSTITUTE ANNOUNCES INDIE EPISODIC, SHORTS & SPECIAL EVENT SELECTIONS FOR 2018 SUNDANCE FILM FESTIVAL". www.sundance.org. ^ ""I'm Poppy" Will Be the Weirdest Thing Ever on YouTube Red"". Variety. January 22, 2018. Archived from the original on January 24, 2018. Retrieved January 22, 2018. ^ "#GIRLTALK: Official interview with singer That POPPY". YouTube.com. Archived from the original on July 23, 2017. Retrieved October 11, 2017. ^ a b Then25 (March 15, 2016). "Getting to Know the Imaginative Vision behind That Poppy". Next2Shine. Archived from the original on June 17, 2016. Retrieved July 15, 2016. ^ Hardy, Alyssa (October 22, 2015). "Suggar and Spice: A Cute Chat With That Poppy!". Ladygunn. Archived from the original on October 28, 2016. Retrieved March 14, 2017. ^ Chesky, Allison (March 7, 2016). "Fashion, Music and Prom According to Pop Sensation That Poppy". Tiger Beat. Archived from the original on August 17, 2016. Retrieved March 14, 2017. ^ Llewellyn, Mallory (July 29, 2015). "Meet The Doe-Eyed Singer Who Made Thrifting An Art Project: That Poppy". Galore Magazine. Archived from the original on May 26, 2016. Retrieved July 15, 2016. ^ Brooke, Eliza (April 11, 2016). "Meet That Poppy and Wonder If You Too Are Missing the Joke". Racked. Archived from the original on October 21, 2016. Retrieved March 14, 2017. ^ Peterson, Tyler (February 12, 2016). "That Poppy – Bubblebath EP". UQ Music Blog. Archived from the original on April 22, 2016. Retrieved March 14, 2017. ^ a b Gibsone, Harriet (January 5, 2017). "Global grime, political struggle and a Chinese pop explosion – what will be 2017's music trends?". The Guardian. Archived from the original on March 17, 2017. Retrieved May 6, 2017. ^ Oberhaus, David (January 9, 2017). "This Is Not an Interview with Poppy". Motherboard VICE. Retrieved May 6, 2017. ^ Anderson, Samuel (January 17, 2019). "The New Generation in Music". V Magazine. Retrieved January 23, 2019. ^ Love Michael, Michael (July 20, 2018). "100 Women Revolutionizing Pop". Paper Magazine. Retrieved January 23, 2019. ^ "Poppy on Disney Channel". YouTube.com. ^ "FULL EPISODES OF WE BARE BEARS ARE ON THE CARTOON NETWORK APP! DOWNLOAD FOR FREE!". YouTube.com. ^ "I'm Poppy is as weird as its namesake YouTube star, but less intriguing". The Verge. January 24, 2018. Archived from the original on January 27, 2018. ^ Weiss, Geoff (October 6, 2017). "Viral Musician Poppy Releases Debut Album, Will Embark On First-Ever Tour". Tubefilter. Archived from the original on December 1, 2017. Retrieved November 19, 2017. ^ "Poppy.Church Box Office". Retrieved July 10, 2018. ^ "Daya, Shawn Mendes & More Nominated for Tiger Beat's 19 Under 19". Billboard. September 8, 2016. Retrieved February 14, 2018. ^ "Poppy nominated for Best YouTube Channel". World of Wonder. November 17, 2017. Retrieved November 17, 2017. ^ "Poppy Unicorn Awards Iconic Moment of the Year". Global. December 16, 2017. Archived from the original on December 16, 2017. Retrieved December 16, 2017. ^ "Poppy Unicorn Awards Song of the Year". Global. December 16, 2017. Archived from the original on December 16, 2017. Retrieved December 16, 2017. ^ "Poppy Shorty Awards Best in Weird". Shorty Awards. January 16, 2018. Archived from the original on January 17, 2018. Retrieved January 16, 2018. 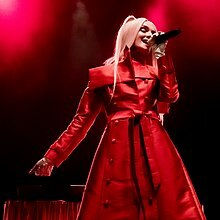 Wikimedia Commons has media related to Poppy (singer).